Well, I had such great plans for reading and blogging this week. I received the nicest email from Alyce of At Home with Books encouraging me to participate in her weekly meme, My Favorite Reads, even though my old age has affected my memory of the specifics of each book. When I came home from school on Thursday I had planned to write my first post for that series. I turned on my computer and heard a tic – tic – tic sound – you know, the sound that you imagine accompanies an explosive bomb. Then the dreaded message appeared on the totally blacked-out screen: Operation System can not be Found. I turned off the computer and tried again. Same scenario. I turned off the computer – waited 10 minutes – and tried again. Same thing. I quickly bundled up my less-than-a-year-old laptop and took it into the Geek Squad at my local Best Buy. “Sounds like you need a new hard drive. Are all your files backed up?” UGH!! Well, 48 hours later I was able to pick up my computer. The good news was that the hard drive was fine – windows just needed adjusting (whatever that means) and all my data files are in tact. The bad news is that this has set me back several days for blog posts —and this being Book Blogger Appreciation Week. I am bummed. I still plan to write the first post for the My Favorite Reads meme – but it will just have to wait until next week. I am currently reading The Sweetness at the Bottom of the Pie and should have it finished this afternoon (good thing too, as it was due back at the library on Tuesday but I refused to take it back unread; I had waited nearly 5 months to receive it). I will hopefully post the review sometime this week. I have discovered two rather fun memes in which I plan to participate sometime in the next several days. One I discovered at Melissa’s Bookshelf and it is entitled, My ABCs – and the other I just discovered this morning at Bloggin‘ ‘Bout Books. 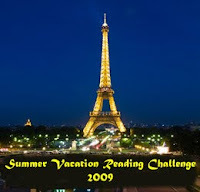 I also plan to post the winner of my Summer Vacation Reading Challenge 2009 which ended on Labor Day. I am so pleased with the number of bloggers who participated and thrilled at the vacation spots that were visited this summer. The winner of the challenge will receive a $25 Amazon gift card. I also thought that I would combine the end of summer (and my first reading challenge) with the beginning of BBAW and offer a give away. One of the highlights of my trip to the Book Expo this past May was to meet the authors of Novel Destinations. I had skimmed the book twice and was thrilled to finally have my own copy. The two authors are as friendly as can be and when I asked if they would be kind enough to autograph a copy for a book giveaway on my blog they were only too pleased to oblige. I am not sure when I will have the giveaway posted – so be sure to check back this week to enter. I began reading The Lovely Bones for my daughter’s 11th grade English assignment, and hopefully we will begin our joint discussion sometime this week. In re-reading the book I am reminded how much I enjoy Sebold’s writing style. She has a way of painting a vivid word picture with very few words. The horror of the crime is portrayed without any gory details. I hope to post the discussions that Mandy and I have on the blog – after we have them (we are having difficulty coordinating our schedules — surprise, surprise). I have read two Victorian short stories from the Oxford Anthology of Victorian Ghost Stories for Carl’s RIP Challenge: The Old Nurse’s Story by Elizabeth Gaskell and An Account of Some Strange Disturbances in Aungier Street by J. S. LeFanu – and I must say that I am really enjoying this genre. While there are several novels that I would also love to read for this challenge, I am just not sure that I will have the time once school is full swing. This week alone I will have 50 papers to grade and that will probably take me 6 to 8 hours. This full-time job significantly crimps my personal reading time. But as you can see, I still manage to do lots of bookish thoughts even if I don’t always have the time (or means) to post them on my blog. I hope you all have a GREAT Book Bloggers Appreciation Week. I know that I certainly appreciate every single one of you! We appreciate you too, Molly! I'm so glad your computer is okay – we are so dependent on them! Computer problems have got to to be one of THE most frustrating things in life. I'm glad everything turned out okay even though you lost some valuable time. It is so scary when the computer does that. I've had it happen before with the operating system, but thankfully my husband is a computer guru and was able to fix it. He's so cool he actually has a special program set to back up my files to a separate hard drive each week. I don't know what I'd do without him (and not just because of the computer stuff of course). I can't imagine having been without the computer right before BBAW. Good luck with all of your posts! I've been working like crazy to get all of mine scheduled and don't have a clue what I'm going to post for My Favorite Reads this week, but I'm sure I'll figure it out. I look forward to reading your post whenever you have a chance to participate, and of course I'll be back this week for BBAW. Glad your computer is better – I feel absolutely lost without mine! As to the library fine, I agree. After waiting for a book for so long, sometime you just have to pay them. Looking forward to reading about your discussion of The Lovely Bones. Oh my, I'd be frantic to lose my computer just before BBAW! So glad you're back in time to have fun. I live in fear of my computer crashing…do you back up your blog? There is a free utility to help do that if you are interested and don't have one. That reminds me I should back mine up.